I worked on an idea for discovery of books a couple of years ago. The idea was simple - make a catalog of your paper books online and tag your location to it. Friends and neighbours would then be able to search for a book using the service and discover books in your shelf. The service would allow making requests for books and manage subsequent interactions between users. I tried developing this concept in residential communities, colleges and online book groups but did not get significant traction to pursue it as a serious business. In the couple of years that followed there were many others who approached or discussed the same idea online and otherwise. I discouraged some of the folks explaining my experiences with traction. I am sure many more would want to try it out. But the fact that there are many people with the same idea points to a possible passionate market however small it maybe. Most of the code I had developed was lying idle and I thought it would help folks trying to build this concept from scratch if I open sourced the codebase. In the last few weeks I refactored the old code and built out a mobile app with the same backend, but used newer technologies to build better capabilities and with less code. 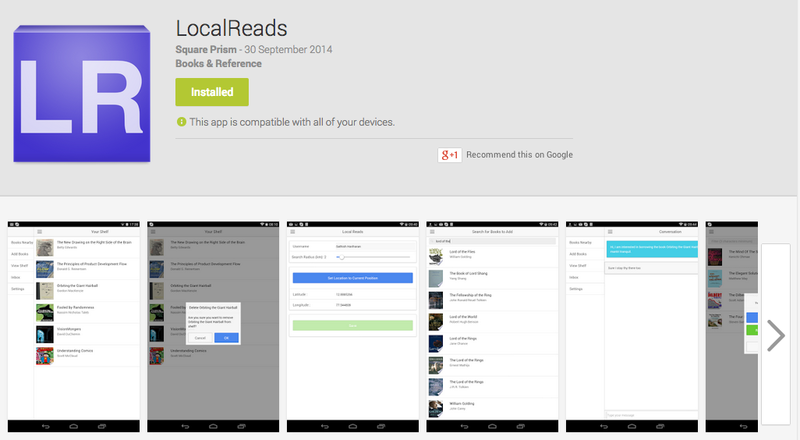 I have published the app for free on Android platform. You can check it out at here. The code is open source and published in github. The android app is developed using the Ionic-Angular framework that lets you build hybrid (html + native) apps. The backend service is implemented as a set of REST apis using Grails with a MongoDB database. You can check out the code on github at the following locations. See instructions for building the codebase in the corresponding github repositories. The front end code uses Protractor/Jasmine for End-to-End testing and Karma/Jasmine for unit tests. The backend uses Spock framework for testing the apis. To build a full stateless restful service in grails I have used the Spring Security Rest plugin as the normal spring security based authentication relies on sessions to be maintained. Real-time messaging is implemented using Spring Websockets. Reach out if you are looking for help in these areas. All of the code is distributed under the Creative Commons License 4.0. All the three types of profiles (I prefer ‘profiles’ to ‘resources’, it sounds more human) can be used to clear blockages in a work queue. Experts have tremendous solving power to clear up technical bottlenecks. So deploying experts in each step can help clear up blocks. But it is difficult to achieve significant depth of expertise and such profiles are scarce. 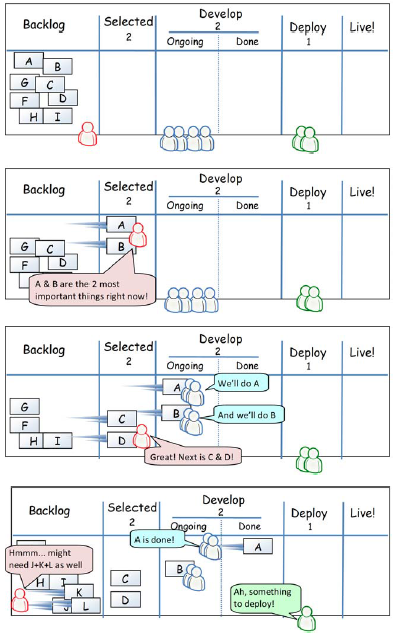 Generalists are profiles that can be deployed in any of the steps in a queue. They can be used to clear minor blocks that occur due to resource unavailability but again finding resources with knowledge of many steps of the process is again difficult. T-shaped resources provide an alternative to the constraints faced in developing and deploying experts and generalists. The idea behind a T-shaped profile is an individual who has sufficient depth in a particular area but can also seamlessly shift to adjacent process steps in a flow. 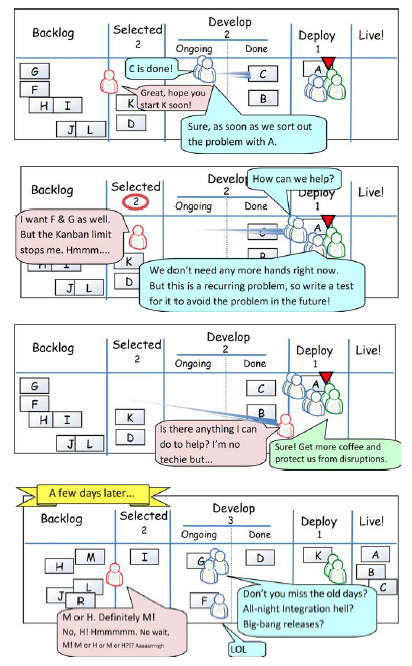 An example would be an expert tester, who can also move easily to development and deployment. 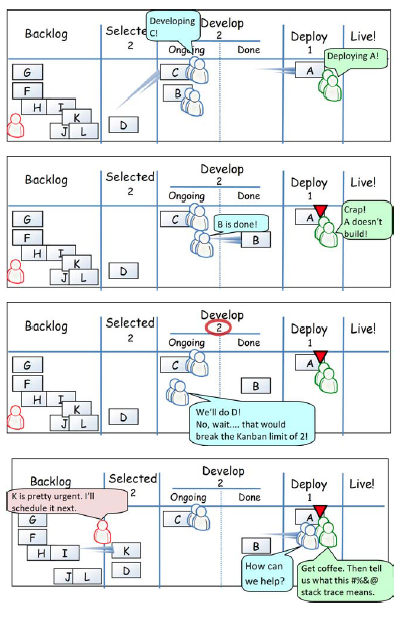 When development faces a capacity bottleneck and cannot move a work item forward, this naturally frees up capacity of testers since there are less items in their backlog due to upstream WIP constraints. This frees up a T-shaped test resource to easily shift focus to development to clear up work items blocked due to lower capacity. As added benefits, such movements also result in improved communication and variety of work. Organization, Dependency and Lifecycle Management Angular provides the concept of organizing code using a Module.One can think of a module as a container for the different parts of your app – controllers, services, filters, directives, etc. Modules specify how an application should be bootstrapped. It has a declarative process easy to understand and promotes reuse.To manage the responsibility of dependency creation, each Angular application has an injector. The injector is a service locator that is responsible for construction and lookup of dependencies. Separation of Concerns At the core of Angular are constructs for implementing Template based views, Controllers and data Models. The framework uses the concept of ‘scope’ per controller bound to an HTML element in DOM, and takes care of two-way data binding between the UI and the ‘scope’. Developer handle changes to scope within controllers and update their models appropriately. Extensibility There are several ways to extend angular and use its features to do work for you. One option is to use specialized objects called directives that help build web components. Another option is to implement *providers”. Custom directives are a powerful feature of Angular and eases code reuse. If all you need is just a simple app implementing MVC (read TodoMVC) that needs to be fast there are many frameworks that fit the bill and Angular may not be the recommended option. But if you have a large and complex codebase that requires better organization, testability, extensibility, dependency management, and separation of concerns in the form of MVC, then a framework such a Angular is the best bet. Above all in Angular as these larger concerns are part of the framework construct, as our code base grows to large sizes, it allows us maintain our sanity !! As web applications become more complex by the day, security becomes an important aspect to consider during development. One way to address the variety of security loopholes in the system is to follow a check-list based approach. Look at the top 10 vulnerabilities web apps face today and address each one of these individually. OWASP (The Open Web Application Security Project) provides a list of top 10 security flaws that web applications face here. Addressing these flaws will help applications reduce a significant percentage of attacks. The list of attacks and the facilities Grails provide to counter these flaws is discussed by Burt Beckwith in his book Programming Grails A summary of the discussion is provided below. Insufficient Transport Layer Protection : One of the easiest ways to do this is to use SSL for your web traffic. Although there is a small cost to using SSL due to the processing work encrypting the pages, you should consider using SSL for the entire site. Then, everything is transmitted securely and the data is significantly less likely to be accessed by attackers. The certificate should use strong encryption, with a key size of at least 128 bits. CSRF : A cross-site request forgery (CSRF) attack is similar to an XSS attack. An attacker will often use XSS vulnerabilities to create pages that make requests on the behalf of other users and send personal information, cookies, or session IDs to the attacker’s server, or perform some action on behalf of the user. The first line of defense against CSRF attacks is to ensure that XSS attacks are not possible. Using insecure cryptographic storage : Storing data requires good libraries for Hashing and Encryption. Passwords are typically hashed. There is rarely a need to decrypt a password stored in a database, because during authentication, you merely need to hash the user’s supplied password and compare it with the previously hashed value. MD5, and SHA-1 are popular algorithms but recent advances in computing have made it easy to break these. One should prefer SHA-256 or SHA-512 for hashing. The best choice is Bcrypt where you can specify number of hash iterations. Adding a “salt” to hashing makes it more robust. The Jasypt library is an excellent tool to avoid having to deal with the implementation details of encrypting data, and there’s even a Grails plugin for it: the jasyptencryption plugin. Unvalidated redirects : Redirecting or forwarding users to other URLs exposes them to being taken advantage of by attackers by taking advantage of some XSS exploit. One way to deal with this is to use server side redirects which cannot be exploited. Another way to address this specific to grails is to use the ‘flash’ scope. We have come a long way from the days where database development meant designing relational models for a database like Oracle or SQL Server. The last few years have seen a proliferation of databases that are meant to perform very specific tasks.Application server middle-ware have also become more flexible and now support multiple data sources instead of having to use just a single DB. Since there are so many options out there it is important to understand the strength and weakness of each and use databases appropriately, based on functional or non-functional requirements. 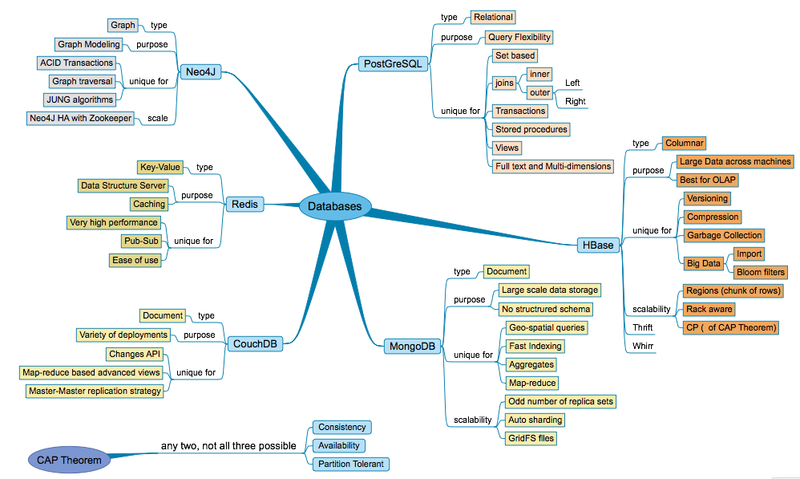 Here’s a handy map of some of the most popular databases and where they would fit into your application architecture. In addition to picking a database based on functional requirements, one may require to access them based on the compromises each one makes in terms of supporting consistency, availability and partitioning tolerance. A popular thumb-rule for such an assessment is known as the CAP Theorem. CAP theorem states that most databases would be able to satisfy two of the three conditions above, but not all - so every database makes a compromise in one of these parameters to satisfy the other two. If one of these parameters are important for an architecture, it may be pertinent to know if a database is making a compromise before making a choice.